Healthy, whole grain pancakes are packed full of protein and fiber, but best of all they taste so good that none of that will matter. In a large bowl whisk together flours, baking powder, and salt, Set aside. In a smaller bowl combine maple syrup, egg, milk, molasses, vanilla, and coconut oil. Fold in your cooked grains and pumpkin seeds. Brush a griddle, set over medium-low heat (or non-stick pan) with a little coconut oil, butter, or non-stick spray. Cook pancakes for about 2 minutes on first side or until the edge begin to look set and little dry. Flip and cook for a minute on the second side. Repeat with the rest of batter, and keep cooked pancakes warm in a low oven. 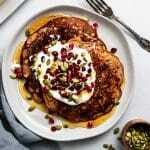 Garnish with yogurt, pomegranate, pumpkin seeds, and maple syrup. Medium-low heat is your friend here. You want to give the pancake time to take on some color as well as set up enough that flipping isn’t a disaster. You can use any cooked grain you have around for this. It’s a great way to get rid of leftover quinoa, brown rice, or farro. If you don’t have any grains already cooked just fill a saucepan with water, bring it the boil, and dump in about 1/2 C of quinoa, farro, or quick cook barley. Boil like pasta until tender (usually between 10 and 15 minutes). Then drain and continue with the recipe.